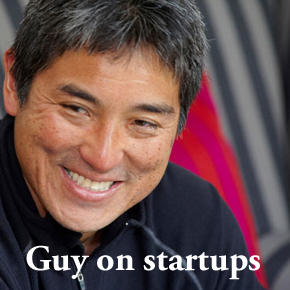 Guy Kawasaki knows his stuff. Before Guy became a VC, he was Apple’s original marketing evangelist. I had the opportunity to interview Guy via email and we talked about startup metrics and common mistakes entrepreneurs make. Guy’s books have been instrumental in my growth as an entrepreneur. I believe his book is so valuable that I bought 20 copies of Enchantment (his latest book) with my own money to give away to TSF readers. Check it out after the interview. What was the most profound influence on your life? The most profound business influence was working in the Macintosh Division at Apple from 1983-1987. Those were the “wonder years” of my life when we were trying to make history with a new kind of computer. I hope that everyone has a chance to work for a leader like Steve Jobs on a project like Macintosh at least once in their life. Could you share a story of how a startup you were personally involved with overcame adversity ? Most startups that are successful has overcome adversity. Starting a company is just plain hard–it’s hard to figure out what product or service to create, hard to actually create it, hard to get other employees to believe in it (this is called “enchantment!”), hard to get customers to adopt it (also “enchantment”), hard to cross the chasm from from early adopters to main street, hard to scale up, and then it’s hard to hand off your baby to people who can run a large organization. And this happens to only the lucky ones! This is the process that most successful startups go thru. It’s not easy or clean. It’s a tough, messy business. If it were easy and clean, more people would do it and succeed at it. When you’re investing in startups, what is the metric you place the most value on? There are three basic theories. First, some investors say they invest in people. The problem with this theory is that it’s impossible to know if the people are really good when you have to make the investment. Second, some investors say they invest in companies in large markets. The challenge here is the most successful companies usually create a market, rather than serve and existing one. Third, some investors say they invest in cool products or services. The tricky part is that most products or services are not done at the point of investment, and even if they are at least working, you really don’t know if people will adopt them. Entrepreneurs should dedicate themselves to reducing all three unknowns and challenges, and there’s a very simple way to do this: prototype a product and get it to market. If you’re right/lucky, then you can show that there is/will be a large market, that people like your product, and that you must be good guys/gals because you’ve come so far on so little money. Fortunately, you can do a lot more these days with a little money because tools are Open Source, people are cheap/free during a recession, Twitter and Facebook make marketing cheap, you can get cheap infrastructure in the cloud, and you don’t need office space because your team can be anywhere in the world with a good Internet connection. Was there a mistake you made repeatedly with startups that you eventually learned from? I used to believe the company’s “conservative sales forecast.” I’ve never seen a company come close to its conservative, worst-case forecast. In fact, now I take a company’s forecast and add one year to the delivery date and divide by 100 as an estimate of what will actually happen. Startups make this mistake because they do a top-down analysis like this: there are 300 million Americans, one in four owns a dog, ergo 75 million dogs, each dog eats two cans of dog food per day, ergo 150 million cans are consumed per day. How hard can it be to get, worst case, 1% of this market or !.5 million cans per day? Instead companies should do a bottom-up analysis. How much traffic can you get to your dog food website per day? Let’s say 5,000. How many will buy a case of dog food from you? Let’s say 1% or 50. How many cans are in a case? Let’s say 20. So it looks like you might sell 1,000 cans a day. The truth is that your sales will be a lot closer to 1,000 cans/day than 1.5 million cans/day. What should a company do to enchant it’s customers? It’s simple. The three pillars of enchantment are likability, trustworthiness, and quality. In a nutshell, you should aspire to the likability of Richard Branson (he got down on his knees and started polishing my shoes when I told him that I don’t fly on Virgin), the trustworthiness of Zappos, and the quality of Apple. High standards, I admit, but at least you know the goal. This is the right starting point, and you’ve got to start somewhere.